This time the the event was at the Flint Center in San Jose. The onsite audience has grown so much that a larger venue was needed. The online audience that watches the ICV Live streaming webcast numbers in the tens of thousands and spans the globe. ICV uses their Mobile Video Flypacks for the event. We use 4 HD cameras and full HD signal path to our Flypacks that use the Panasonic HS 450 HD-SDI switchers. 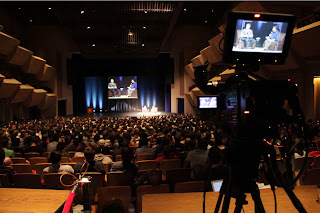 If you saw the Startupschool.com live webcast, you saw ICV's video webcasting stream.